The story in front of us is simple. The Parliament — both Government and Opposition — chose to amend two bills: Judges Salaries and Pension Bill and the Retiring Allowances: Legislators. Nothing weird here. Law making, legislation, bill amendments etc are the business of the Parliament, yes? So, it stands to reason that if changes have to be made to a law, it’s our legislators that should get in there and earn a salary, yeah? By Saturday, Ms Taitt’s stories of fat pensions, stopped being simply an issue of “them MPs tiefing from the Treasury again, wha we go do boy? Aye, the match start yet?” and started being likened to Section 34. You remember that fiasco, right? A Bill proclaimed in the dead of night during our 50th Anniversary Independence celebrations? That had both Government and Opposition support in Parliament, but didn’t have Opposition support for the new declaration date? By Saturday June 21st the swell of dissent had begun. Martin Daly SC and Reginald Dumas, former head of the public service, regular go-to advisors for the Trinidad Express, were out the blocks first. With Daly insisting that it was a breach of the Constitution, and that the integrity of judges — now reliant on MPs for their improved salaries — was in question; and Dumas questioning the adding of allowances to the calculation of pensionable emoluments and stating emphatically that there was no precedent for such. These bills are unconstitutional. They pertain to the setting of compensation for judges, senators and MPs. The Government is not authorised to determine its own compensation, nor the compensation of the Judiciary. Only the independent, autonomous, Salaries Review Commission (SRC) which reports solely to the President, may make recommendations in this regard. In this way, the Constitution protects the country against executive abuse. No democratic country in the world permits its legislators to determine their own compensation. Her statement couldn’t be clearer. Himself was passing Amendments to pay Himself and bypassing the enshrined Constitutional arrangements. The Salary Reviews Commission was being sidelined by the Government, and worse yet, the Opposition was supporting this! For $$$$$$$$$. Two important details to note here: the SRC weirdly enough is in a position to determine its own salaries according to our Constitution and Jackie Carr-Brown is allegedly married to a member of the Salary Reviews Commission, hence her knowledge. 1. MPs had bypassed the SRC to give themselves pensions especially since the were displeased with the salaries recommended by the SRC in November 2013. 2. MPs had done the unprecedented thing and added allowances to their pensionable emoluments. The burden of these new fat pensions would cripple the Treasury. 3. In determining the pensions of retired Judges, the Parliament had breached the Constitution by threatening the separation of powers, a pillar on which our democracy (such as it is) stands. Then by Sunday afternoon, in the midst of my baked fish and callaloo, just as I was prepping for the USA vs Portugal game information starts pouring out of my phone. Damn you Google Search! He said the Judges Pensions Act, which was enacted in 1962, and judges pensions have never been revised upward since then. “The Government is seeking to increase the amount of pension paid to a retired judge from 1/360th to 1/300th. The amendment would also provide for a periodic revision of the pension paid to retired judges of the Supreme Court, as well as a more favourable computation of the pension paid to judges of the Supreme Court,” he said. Furthermore, the amended bill will propose a recalculation of the pension of judges who have retired for more than ten years. If the SRC objected to this announcement by government then, I didn’t stumble upon any articles. What is also noteworthy is that amending MPs pensions was not on the cards then at all. But somehow after the new salary recommendations made by the SRC November last year, it certainly got tabled quickly. 2. Several senior members of Government and even retired Judge, Zainool Hosein have insisted that the SRC, for at least two decades, has dragged its feet on reviewing salaries and compensation packages and has stated categorically it is not responsible for pensions. In yesterday’s Expressem> retired Justice Zainool Hosein stated: “We are no longer in office. The pension is only payable to past office-holders and therefore the separation of powers is not an issue,” he said. Hosein said in respect of the retired judges that SRC has consistently taken the position that the pension, of retired judges do not fall within their jurisdiction. “They took the view that that matter must be dealt with by Parliament,” he said. “Now it has been dealt with by Parliament, by both Government and Opposition (which agreed to it), and I am a little surprised that on a matter in which they (SRC) claim no jurisdiction they are reportedly expressing concerns,” he added. According to Section 141(1) of the Constitution, the SRC, with the Approval of the President, can from time to time, review the salaries and other terms and conditions of services of the offices falling within its purview. I’m not a lawyer or legislator. I can’t even begin to tell you if those words mean pensions are covered. I can’t even say if those words mean that the SRC has jurisdiction over retired judges. What I do know is that apart from the SRC, there are specific Acts that address Judges’ Pensions and Legislator’s Pensions and the only people that can make changes to those acts don’t sit on the SRC….they sit in Parliament. Opposition and Cabinet. I’d recommend reading the 98th Report of the Salaries Review Commission if only to see what the purpose of the Commission is and what kinds of salaries and allowances are paid to Presidents, Prime Ministers, Commissions and senior Public Servants. 3. The Pension amendment comes from a contributory fund. This means its impact on the Treasury is different. Whereas mid to lower range Public Servants depend entirely on the state to pay their pensions, gratuity and lump sums, Judges and MPs have to contribute a percentage of their salary towards their pension, and the State provides the rest. What I’m still unclear on is what the ratios are and how much it is going to cost the State. I’m also keeping in mind that Judges don’t pay taxes on their salaries at all and watching that reaaaaaaaaaal cockeyed. 4. With respect to the unprecedented nature of adding allowances to pensionable emoluments….it actually isn’t unprecedented. According to the Pensions Act Chapter 23:52: “”pensionable emoluments” in respect of service under the Government of Trinidad and Tobago includes salary, personal allowance, inducement allowance, house allowance or the estimated value of free quarters and any fees paid out of the Treasury by way of salary …”. This is in the Pensions Act of 1934 that has been amended as recently as 2010. 1. Does the SRC have oversight of pensions? And if so, why were pensions not covered in their 98th Report delivered in November 2013? Was it an oversight? Because for the sub-category of Pension in their report they simply point to whatever pertains in the relevant Acts of the Constitution. 2. Was the SRC stealthily bypassed by the Cabinet and the Opposition in the aftermath of substandard salary recommendations in 2013? Does this ability to bypass the SRC and instead amend Pensions point to a flaw in our Constitution? Is the SRC still a relevant institution? 3. What financial impact will these pension packages actually have on the Treasury? In short, how much more burden will our tax payers have to bear? Especially in light of 4 massive deficit budgets from Kamla, and the likelihood of a fifth such Budget in September. 4. Has separation of powers been breached and the Constitution subverted? If the judges are retired, does this make a difference? Will sitting Judges feel indebted to MPs now for improved pension plans in years to come and give them a bligh because of that? 5. Is the addition of allowances to pensionable emoluments really unprecedented? And since they aren’t,why do I feel as if the way in which these new pensions were calculated is going to give me indigestion and a tax burden that I can’t stomach? We are roughly a year away from the 2015 election period. In the last 4 years we have experienced too many instances of the Government brutalizing the Constitution and the Treasury for its own ends. 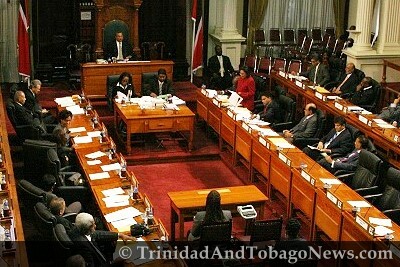 We have been subjected to massive budgets and squandermania from Kamla and her Small Goal Squad. Most recently we found out that through the LifeSport programme the Government is funding criminals, and taking out loans against the treasury to pay these criminals and soon wants another $32m to pay off debts incurred by this same programme that funds criminals. Did I mention this government is funding criminals? Now, in under a week, we learn that both sides of the Parliament, not pleased with the recent salary increases granted to them earlier this year, are now sorting out their retirement. I can’t say it’s illegal. Not yet. The SRC has to clarify whether Pensions really fall under its purview. The Constitution’s language is too vague for me to say so convincingly. I’m hoping the Senate’s debate today throws light. What I can say is in light of the burden on our treasury and our numerous labour and employment issues this leaves a very bad taste in my mouth…..and I’m giving you, Keith Rowley, a devious cut eye on this one. ** No footballers were hurt, or red cards given, in the writing of this post. As long as people have to go to San Fernando Hospital and sit on the floor for hours to get a bed, I cannot understand these “obscene” increases. It is shameless. Mamoo, I do share your sentiments. It is true that I’m in favor of an increase in the pay for our parliamentarians whilst serving, it is obscene for the taxpayers to have to maintain their lifestyles upon retirement. Whilst serving, the temptation to be lured into bribery and taking kickbacks goes with the office, it is hard to refuse if the MPs are lowly paid, but if we pay them well and they still get involved with those underhanded behavior, then we need to insist that legislation be passed to arrest and charge them for bribery. It is indeed hypocritical of Rowley and the PNM to have just passed on this bill without a lively debate to at lease show the people that they have a conscience. So, when parliamentarians behave like Anil Roberts, the tax payers are obliged to fork out $50,000 per year for his lifestyle? C’mon, where is the ethical conscience of the legislators? They deserve to be paid well and given a reasonable pension. But a pension from $5000 to $36000 is downright greedy especially since the government run a deficit in their last 5 budgets. Those who serve the nation do it out of love and desire for a better nation. Yes while an MP is serving they deserve to be well paid. How much was Gandhi paid? How do you legislate greed? “Right now, I am very ill. All my medication have finished and I don’t know where to get them. I was supposed to go back to the US because I have a medical appointment…..” Blah , bla blah..booooo. woooo! How pathetic indeed,and pray someone ,explain to me how someone , as in this ridiculous example,can claim to be trapped in his own country? Yep, the crime situation , health care service , education system,and economy,are all out of whack? Let’s blame ET from Planet Venus. Runaway corruption , social injustice, porous borders,where illegal immigrants, and drug mules run free,financial improprieties of the highest magnitude, particularly by cronies, and let’s point fingers at every where but at self. So the electorate, disgusted with that arrogant Sando geologist, gave you an overwhelming mandate to run this country, four years ago, then you along with your party continue to stink up the joint, as your minions commit repeated faux pas , and the occasional criminality-with no price to pay. Let me guess how you wish to be rewarded in a few months time, come the next due election. Ummmm, and what do you know, the good lady, and her UNC dominant party, might just pull it off, Guyana style,por quy? I’ll tell you! The PM in waiting, is busy sitting on his hunches, playing counter attack football, as opposed , to showing some aggressiveness, and real political initiative. Sorry Dr Rowley, but it’s time to put on your ‘big boii pants,’for just like in the World Cup,no serious fan cares how man trophies were acquire in the past,by well known glorified teams, neither would savvy Trini voters, salivate over past political stewardship by an aging , seemingly clueless party, come 2015. However I digress, ummmm this is about soccer mad T&T, goal scoring ,and pensions increases, not sub par governance, suspect leadership, or the plight of a typical country hating citizen, such as Bally Mahabir here,only too willing-with the help of an enabling media agents- to publicly throw his underachieving country, under the symbolic bus, all because he is unable to acquire a passport to run back to that great industrial metropolis called America. I luv dis land, U tu?